A brain tumor arises when some brain cells start to multiply abnormally, creating a mass inside the skull. There are several types of brain tumors, from benign to malignant, the latter called brain cancer. A brain tumor can originate in the brain itself or be a metastasis of cancer that originates in another part of the body, such as breast cancer or skin cancer, for example. 1. Local cerebral invasion: when the tumor occupies the space where there should be only healthy neurons. 2. Compression of structures adjacent to the tumor: when the tumor compresses areas of the brain around them. 3. Increased pressure inside the skull: Since the skull cap is unable to expand, any mass that grows relevant within the skull may begin to compress the entire brain. The clinical manifestations of the brain tumor depend on the size, speed of growth and its location within the brain. In this article we will address only the main symptoms that the patient may present when a tumor, whether benign or malignant, develops in their brain. Soon we will write a more comprehensive article on brain tumors, reporting their types, risk factors, diagnosis and treatment. Headache is a common brain tumor symptom, and is considered the worst symptom for about half of the patients. Headaches are usually constant and boring, although they are usually not very strong. Sometimes the brain tumor headache can be pulsatile, like a common migraine. Despite popular belief, the brain tumor rarely causes severe headaches. Severe headache only occurs when the tumor causes a large increase in intracranial pressure or when there is irritation of the meninges (tumoral meningitis). It is important to note that headache is an extremely common complaint in the general population, with more than 95% of people complaining of headache presenting with a cause other than a brain tumor. Nausea and vomiting (present in about 40% of patients with tumor, but also very common in people with migraine). Changes in the usual pattern of your headache. Worsening of headache with changes in body position, such as bowing or lowering of the head, or with maneuvers that raise intrathoracic pressure, such as coughing or sneezing (such aggravation may also occur in other headaches such as those caused by sinusitis). Headache well located in a region of the skull (again, this feature may be present in other forms of headache). Headaches that worsen at night and are able to wake the patient during sleep. In fact, the main characteristic of brain tumor headache is that it is usually accompanied by other neurological symptoms, such as seizures, syncopations or weaknesses in one of the limbs. Only about 15% of patients with brain tumors have a headache as a single symptom, and even then, for a short time, most develop other symptoms within 2 to 3 months. Seizures are among the most common symptoms of gliomas (one type of brain tumor) and brain metastases. Even patients who do not present seizures at the onset of the condition may have them with the course of the disease. About 60% of patients with brain tumors have at least one seizure during the course of the disease. Although it is a symptom that frightens family members, convulsive crisis is more common in less aggressive forms and smaller tumors. In many cases it is the first symptom to emerge. The seizure is caused by an abnormal electrical activity in the brain. It lasts only a short time and can cause involuntary movements, loss of consciousness and / or sensory distortion. There are many different types of seizures. Convulsive seizures may be partial, with involuntary movements in only one region of the body, or generalized, with loss of consciousness and generalized tonic-clonic seizures. After crises, patients become exhausted, needing to lie down or sleep. If not treated with anticonvulsants, the patient tends to have other seizures over time. A significant increase in intracranial pressure may temporarily cut off cerebral blood perfusion, leading to loss of consciousness, called syncope. Patients with brain tumors are particularly susceptible to this sequence of events. Temporary elevation of pressure inside the skull can be triggered by straining, coughing, sneezing or vomiting. It is good to point out that there are several causes for syncopes, some of them also triggered by the same situations described above. Either way, syncope is not a normal event and should always be investigated by a physician. Cognitive dysfunction is a brain tumor symptom that includes memory problems, mood or personality changes. 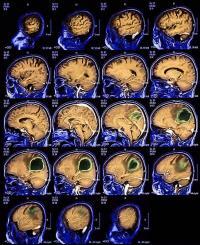 Most of the cognitive deficits associated with brain tumors are subtle. Patients often complain of having little energy, tiredness, constant urge to sleep, and loss of interest in daily activities. These symptoms may be similar to the symptoms of depression. Memory loss is also mild and is more important for recent events that occurred just a few minutes ago. Memory for ancient facts is usually preserved. As already mentioned, in some cases these symptoms may be very subtle and non-specific and are often only retrospectively recognized after the diagnosis of a brain tumor has already been investigated and established after some other, more obvious symptom emerges. 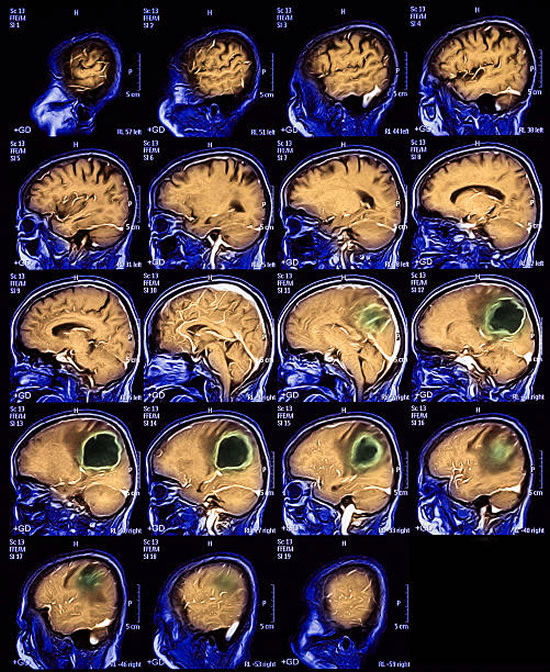 Depending on the area of the affected brain, the brain tumor patient may have so-called focal neurological symptoms, which are localized symptoms, caused by the involvement of a single region of the brain. Among the focal symptoms we may mention speech loss, hearing loss, tinnitus, loss of sensation in a particular region of the body, localized muscular weakness in one or more limbs, loss of motor coordination, imbalances, walking difficulties, visual changes, etc.